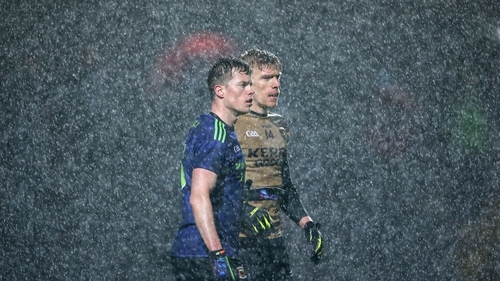 A 67th minute goal from Matthew Ruane propelled Mayo to a shock victory and ended Kerry’s unbeaten run in front of more than 12,000 rain-soaked spectators in Tralee. Ruane’s first goal of his senior career means that Mayo are right back in the mix again for a place in their first league final since 2012 ahead of next Sunday’s home clash with Monaghan. Kerry are almost certainly assured of their place in the final ahead of their trip to Roscommon next weekend, but this defeat means the possibility of them missing out on scoring difference still exists. The league leaders were powerless to prevent James Horan’s visitors from racking up their fourth win of an erratic league campaign. Mayo — who lined out without regulars like Lee Keegan, Colm Boyle, Paddy Durcan, Seamie O’Shea and Cillian O’Connor — had trailed at half-time by three points: 0-4 to 0-7 as Kerry made the most of the gale at their backs in the opening period. Kevin McLoughlin and Kerry substitute Diarmuid O’Connor traded points during the third quarter to maintain the status quo before Mayo took command. First, Fionn McDonagh pointed after a mazy run, before Jason Doherty tagged on two points from frees to level the game. Mayo substitute Fergal Boland also fisted a crucial sore during this purple patch as the Westerners laid siege to the Kerry goal. This left Mayo in front by 0-7 to 0-6 with 65 minutes on the clock and the tide had turned completely. Kerry hit back with a brilliant Sean O’Shea free into the teeth of the hurricane that blew down the middle of the field all night, but the game’s defining moment arrived moments later. There were only three minutes of normal time left when Mayo midfielder Matthew Ruane broke through the Kerry defence before slotting the ball under Brian Kelly for the only goal of the night. During the six minutes of additional time played, Kerry hit back with an O’Shea free and a point from substitute James O’Donoghue, but Mayo held on for their second win in Tralee in two years. Earlier in the evening it had taken the hosts the entire first quarter to get to grips with the atrocious conditions, but they were still worth their three-point lead at the break. Their top scorer, Sean O’Shea, was the main man for the home side in that opening half, kicking four of Kerry’s seven points, with Kevin McCarthy chipping in with two scores, and Tommy Walsh clipping over a point from a mark. However, Mayo had started the game brightly and were three points to the good inside the opening seven minutes, with Kevin McLoughlin opening the scoring followed by a Matthew Ruane effort after a strong run and a Jason Doherty effort from out on the right. But most of the drama and excitement came in the closing stages before the curtain come down on a wet, windy and eventful night at Austin Stack Park. Mayo: D Clarke; C Barrett, B Harrision, K Higgins; S Coen, M Plunkett, D Vaughan; M Ruane (1-1), A O’Shea; F McDonagh (0-1), C Loftus, D O’Connor; K McLoughlin (0-2), J Doherty (0-5, 4fs), J Durcan. Subs used: F Boland (0-1) for Loftus; A Moran for Durcan; L Keegan for Vaughan; C Boyle for Plunkett; R Hennelly for Clarke. Kerry: B Kelly; P Crowley, T Morley, B O’Beaglaioch; G Crowley, P Murphy, T O’Sullivan; J Barry, M Griffin; D Moynihan, S O’Shea (0-6, 3fs, ’45), G O’Brien; K McCarthy (0-2), T Walsh (0-1, mark), S O’Brien. Subs used: D O’Connor (0-1) for McCarthy; T O’Se for Moynihan; J O’Donoghue (0-1) for Walsh; A Spillane for Griffin; C Geaney for O’Brien.